This week, for French Fridays with Dorie, there’s another main dish on deck. 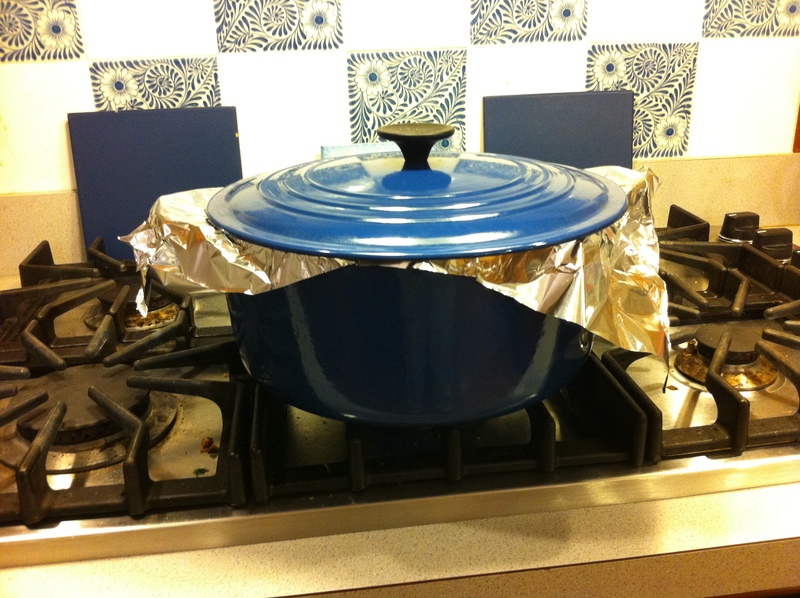 This time, it’s a one-pot dinner, my favorite kind of thing: braised cardamom-curry lamb. This hearty stew was perfect for the cold snap that just arrived. The curry flavors in this stew aren’t ones I usually cook with, but I liked the variety it added to the week’s meals. After the deception I tried to pull with last week’s soup, I didn’t think I would be able to sneak most of the fruity ingredients into the lamb stew. Miraculously, Howard does eat figs, dried or fresh, but I knew the raisins and apples were out. I had to come up with a different plan. When making stews, I will typically halve the meat and double the vegetables that the recipe calls for. 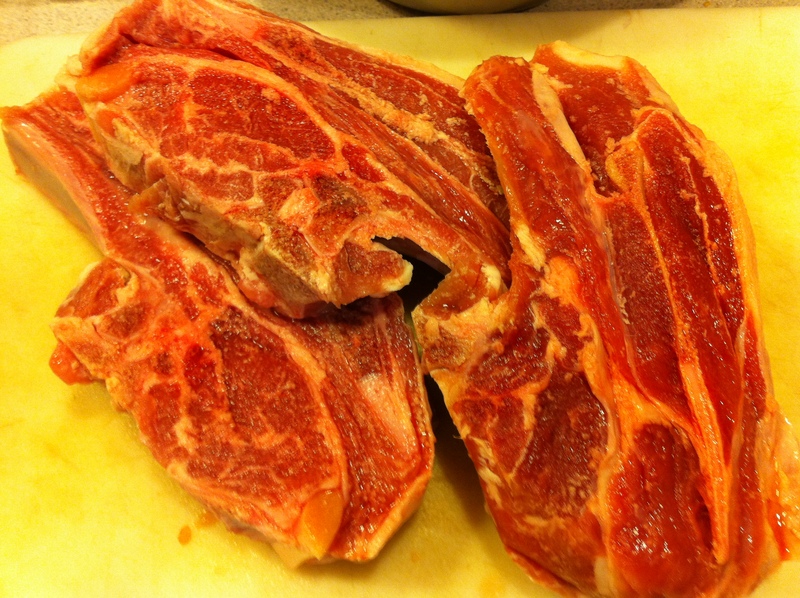 For this recipe, I started with about 2 pounds of lamb shoulder chops I had from our meat CSA. There were more bones than I expected, so I ended up with only about one pound of lamb cubes. 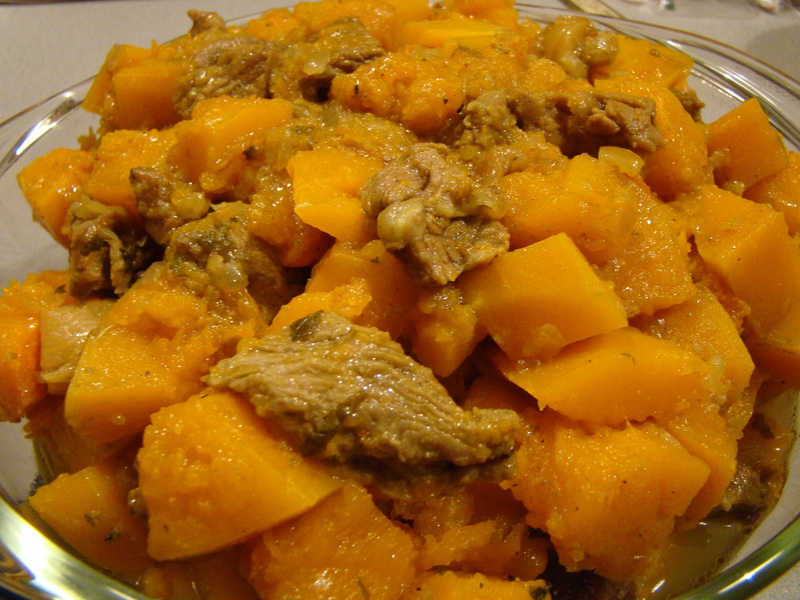 As a substitute for the apples, I used a butternut squash cut into one-inch cubes and left out the potatoes. With its braising time of over an hour plus prep time, this recipe is definitely not after-work-weeknight cooking. I ended up making it last night, but we didn’t eat it yet.. The steps were straightforward, though there was a lot of chopping. First, onions and garlic were slowly cooked with curry and cardamom until they softened. Then, the cubes of lamb were stirred in until lightly browned. Water, honey, figs, mint, and squash were added and then braised in a tightly covered Dutch oven until tender, about an hour for me. I keep calling this a stew, but braise is more accurate. The meat and vegetables were tender like a stew, but there wasn’t much liquid left in the pot. I tasted a few bites of lamb, squash, and liquid, before I put this away last night. I liked the warm, spicy flavors from the curry and sweet vegetables. We’ll have this for dinner tonight, and I plan serve it over egg noodles with a green salad on the side. If you’d like to see how other versions of braised lamb came out, check out the links of other creative bloggers’ posts at French Fridays with Dorie. The recipe can be found in Dorie Greenspan’s book Around My French Table. I want to wish a happy Thanksgiving to all my FFwD friends and their loved ones. One of the many things I’m thankful for this year is the opportunity to meet (virtually, anyway) so many other cooks that share my passion for food and cooking. I’m enriched by the experience.